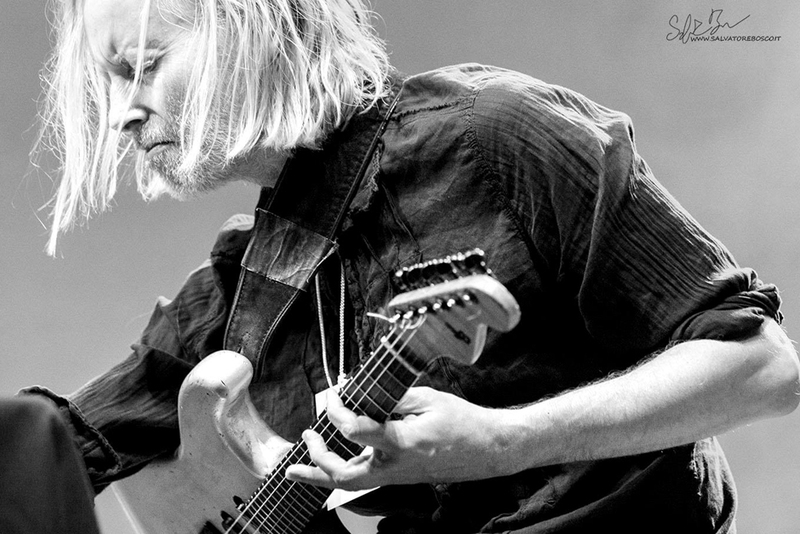 As one of Norway's most in-demand guitarists, Eivind Aarset has worked with Jon Hassell, David Sylvian, Bill Laswell, Jan Garbarek, Paolo Fresu, Marilyn Mazur, J.Peter Schwalm, Mike Manieri, Marc Ducret, Michel Benitas Ethics, Martux-M, Stefano Battaglia, Michele Rabbia, Talvin Singh, and Andy Sheppard. He has worked with Nils Petter Molvaer's band, (appearing on all of Molvaer's albums, including the breakthrough album "Khmer" and 2006's award-winning "ER"). He also has collaborated with Dhafer Youssef, both live and in the studio. "Connected" marked yet another leap up on Aarset's evolutionary ladder and sits like a prelude to a manifesto. "Connected" perfectly captures Aarset's working method. His musical world is uniquely his, and the vocabulary of his guitar describes it as no one else could. The music has become self-referential, yet manages to retain warmth and openness. The overtly club music aspects of the sound have been fully consumed, and are accompanied by a new glitchiness, courtesy of Jan Bang, Erik Honoré and Raymond Pellicer. Aarset's reflexivity progresses boldly, offering "Changing Waltz", a variation and re-visioning of "Empathic Guitar" from "Light Extracts". Unburdened by the history of electric guitar and guitarists, Aarset erases any of the potential egoism of being a guitarist with a Zen-like calm in favour of stronger musical statements. In addition to Hans Ulrik's clarinet comes Dhafer Youssef's oud and voice, bringing the electronic and the acoustic to a new equilibrium rarely achieved. Aarset also has appeared on the album "Jazzland Community", a document of the 2006/ 07 tour featuring Bugge Wesseltoft, Sidsel Endresen, Håkon Kornstad, Marius Reksjø¸ and Wetle Holte. Two Aarset tracks appear, "Connectic" and "Electromagnetic", and two ensemble pieces: "The tour was a great experience for me," says Aarset. "I loved the way our different styles and concepts worked together and came out as a whole unified concert, not just different acts in one show. And the collective improvisation at the end of each concert was amazing. It was always happening." "Sonic Codex", Aarset's forth Jazzland release, is perhaps the strongest studio album with a band he has produced so far. "Sonic Codex" takes concepts from his earlier albums, restates, elaborates, and then amplifies them to create a true masterwork that may well be a defining moment in both Aarset's career and the history of Jazzland. The album's title is a perfect summary of its hour-long contents: it is a SONIC CODEX. It puts forward Aarset's rules of engagement with the listener, and very deliberately quotes and redefines the musicality that made up his previous three albums, "Electronique Noire", "Light Extracts", and "Connected", yet also points his way forward; it is an innovative present that simultaneously summarises the past, and predicts the future. Although "Dream Logic", Eivind Aarset’s fifth studio album seems to mark a departure in many ways (his first album as leader outside Jazzland Recordings, and no "band" in any conventional sense), the identity is unmistakable. Working closely with Jan Bang – who co-wrote several of the tracks – "Dream Logic" like its predecessaor, "Sonic Codex" lives up to its title, with motifs and musical "images" merging and emerging from guitar-based soundscapes. At one fluid and dynamic, the effects can be hypnotic or disconcerting by turns, yet the feeling throughout is that one is listening to an artist at the peak of his powers. The working relationship with Jan Bang has been one that has made some important contributions to Aarset’s previous albums (notably "Family Pictures", a 3-part piece spanning two albums), but here that relationship has created something familiar and strange, and perhaps represents Aarset’s most ambitious project to date, not in the scale of the production, but in the capable and determined exploration of hitherto barely explored regions of his sonic world. The results are, invariably, beautiful. Where Aarset will go from here is anyone’s guess, but what is certain is that the journey will be worth taking.